A VBA Type Mismatch Error occurs when you try to assign a value between two different variable types. The error appears as “run-time error 13 – Type mismatch”. For example, if you try to place text in a Long integer variable or you try to place a number in a Date variable. Let’s look at a concrete example. Imagine we have a variable called Total which is a Long integer. If we try to place text in the variable we will get the VBA Type mismatch error(i.e. 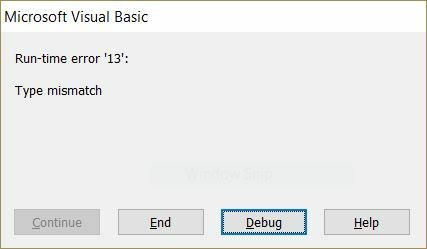 VBA Error 13). Let’s look at another example. This time we have a variable ReportDate of type Date. In general, VBA is very forgiving when you assign the wrong value type to a variable e.g. A simple way to explain a VBA Type mismatch error, is that the items on either side of the equals evaluate to a different type. When a Type mismatch error occurs it is often not as simple as these examples. For these more complex cases we can use the Debugging tools to help us resolve the error. 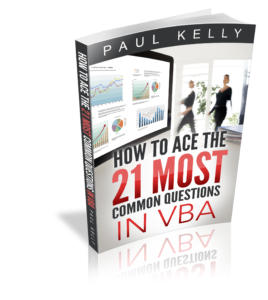 VBA has some very powerful tools for finding errors. The debugging tools allow you to pause the code and check the values in the current variables. 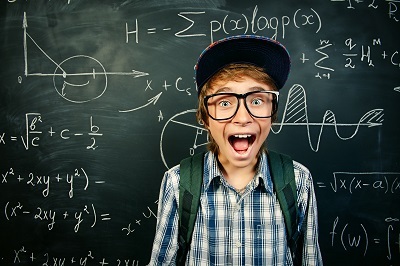 You can use the following steps to help you tackle any VBA Type mismatch error. Run the code so that the error appears. Click Debug on the error dialog. This will highlight the line with the error. Select View->Watch from the menu if the Watch Window is not visible. Highlight the variable to the left of the equals and drag it into the Watch window. Highlight everything to the right of the equals and drag it into the Watch window. Check the values and the types of each. You can narrow the error further by examining the individual parts of the right hand side. In the screenshot below, you can see the types in the Watch Window. By using the Watch Window, you can check the different parts of the line of code with the error. You can then easily see what the variable types are. The following sections show the different ways that the VBA Type Mismatch error can occur. As we have seen, trying to place text in a numeric variable can lead to the VBA Type mismatch error. VBA is very flexible when it comes to assigning a date to a date variable. If you put the month in the wrong order or leave out the day, VBA will still do it’s best to accommodate you. The following code examples show all the valid ways to assign a date followed by the cases that will cause a VBA Type mismatch error. curDate = "Some Random Text"
A subtle cause of the VBA Type Mismatch error is when you read from a cell that has an error e.g. To resolve this error you can check the cell using IsError as follows. However, checking all the cells for errors is not feasible and would make your code unwieldy. A better way is to check the sheet for errors first and if errors are found then inform the user. MsgBox "There are errors on the worksheet. Please fix and run macro again." 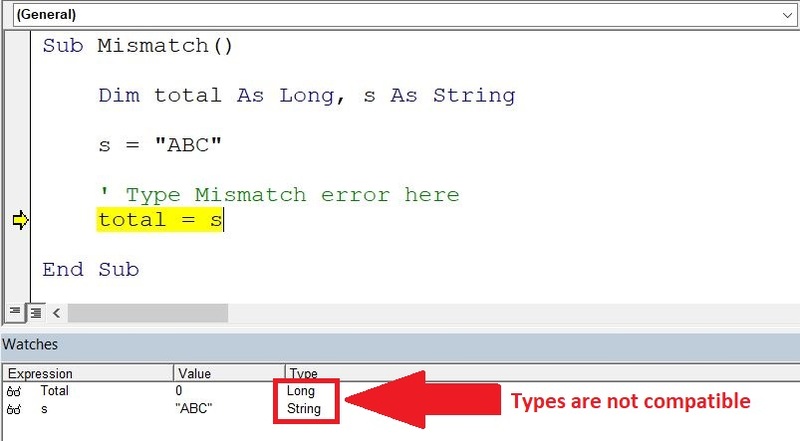 As we saw, placing an incorrect value type in a variable causes the ‘VBA Type Mismatch’ error. A very common cause is when the value in a cell is not of the correct type. A user could place text like ‘None’ in a number field not realising that this will cause a Type mismatch error in the code. If we read this data into a number variable then we will get a ‘VBA Type Mismatch’ error error. MsgBox "One of the cells is not numeric. Please fix before running macro"
If you use the Module name in your code this can cause the VBA Type mismatch to occur. However in this case the cause may not be obvious. For example let’s say you have a Module called ‘Module1’. Running the following code would result in the VBA Type mismatch error. So far we have been looking mainly at variables. We normally refer to variables as basic data types. They are used to store a single value in memory. In VBA we also have objects which are more complex. Examples are the Workbook, Worksheet, Range and Chart objects. A chart sheet is created when you move a chart to it’s own sheet by right-clicking on the chart and selecting Move. If you read the Sheets collection using a Worksheet variable it will work fine if you don’t have a chart sheet in your workbook. If you do have a chart sheet then you will get the VBA Type mismatch error. In the following code, a Type mismatch error will appear on the Next sh line if the workbook contains a chart sheet. You can assign a range to an array and vice versa. In fact this is a very fast way of reading through data. The problem occurs if your range has only one cell. In this case, VBA does not convert arr to an array. This concludes the post on the VBA Type mismatch error. If you have a mismatch error that isn’t covered then please let me know in the comments. The Currency variable type is a number with 4 decimal places. See VBA Data Types here. Thanks. I have updated it. I’m trying to loop through the shapes on a slide. for each shp in whateverslide.shapes <— this line gives me a type mismatch but the watcher says shp is type "shape" and whateverslide.shapes is type "object/shape"
The slide exists and has lots of shapes on it. The macro is in excel. It opened an existing powerpoint presentation and is manipulating the slides/shapes. That code looks fine at an initial glance. Without access to the actual code and workbook, it is difficult to say what the issue is. I changed “dim shp as shape” to “dim shp as object” and the type error went away. What’s the difference between “shape” and “object/shape”? Googling isn’t helping. When you write code in Excel you need to use an external library to access the Powerpoint code. You can access using early or late binding. Early binding means you add the library(e.g. Microsoft Powerpoint 16.0 Object Library) from tools reference. You can refer to shapes etc. as normal items. Late binding means you using CreateObject to access the library. In this case you must refer to variables in the library as objects. The reason is that VBA will decide at runtime, which type of object they will be. I hope you can help me. We use VBA code in Dynamics GP. We have a currency field and we need to check if the field value is 0. The following code has been working for various currencies all this while and I can’t understand why it is now failing. Cash1 is a Currency field on a window. I hit a Type mismatch error on the line. The cell in Excel is a text field rather than a currency field. The code works with Excel 2016, but the error type mismatch appears in Excel 2010. Do you have any idea what the problem is? The code has been used for some years and have worked without any problems before. I have built my modules in Microsoft Excel 2016 ’32bit’ version. And when I run the code in my friend’s system, Microsoft Excel 2016 ’64bit’ version, it shows type mismatch error. My code works fine on all systems but failed in 64bit system. Then I came across to the article, where the author has said, there are few changes for 32bit and 64bit in the declaration of variables. Like, during the calling windows API’s through functions, we need to put “ptrsafe” right before the declaration. And I found one more thing in the 64bit system, declaration of the variable with datatype LONG will create type mismatched too. How, because in VB7 or 64bit version, LONG is referred as ‘LONGLONG’ and my whole coding the few variables are defined as the LONG instead of LONGLONG. So, am I correct? are those things generating an error? The only change you need to make is to use the PtrSafe for 64-bit versions. LongLong is how the 64 bit version stores long but you just declare long and VBA will look after the storage. Type Mismatch in mostly caused by trying to place a string value in a numeric type. If you try to put a different numeric type in a variable then VBA will automatically convert this in most cases. Check the value and type of variable in the watch window and you should see the incompatibility between the types you have. Thanks for the reply and I’ll surely check my code using watch windows. I am running a loop which deducts dates from one an other. However, this is leading to a type mismatch error. When the error appears, click on Debug. Highlight and drag each of the following pieces of code to the watch window. You will see that one has a non-numeric value. in a project on which I’m currently working, I have a Type Mismatch error which is not included in your listing. It is just “Type Mismatch” without any error number and the header of error message window says it is coming from Visual basic for applications. When this error occurs, the debugger will not detect it. It won’t stop on any line of code. When I press the OK button in the message window, it disappears and everything is working as expected. I was able to detect one procedure where this error occurs when this procedure is called. But the procedure is running from start to the end as expected, just the type mismatch error occurs during executing the code without stopping debugger on the line where the type mismatch error would be coming from. When I try to debug the procedure step by step, the type mismatch error do not occur. Any ideas how to track the source of this type mismatch error? This error occurs in Office 365 (latest release to date) as well as in Office 2010. It sounds like a tricky one. Without seeing the code it is hard to tell. If you add Debug.Print statements to the code it will help you track it down. When you find the line where the error occurs it should make it easier to see what the problem is. The mismatch error pops up when I put in this code and highlights the 2nd if statement. I need the code to work on a range of data instead of just one cell. I notice that if I change the range to just one particular cell i.e “D6” instead of “D6:D20” or “E6” instead of “E6:U20”, the code works. Can you advise on what I’m doing wrong here? 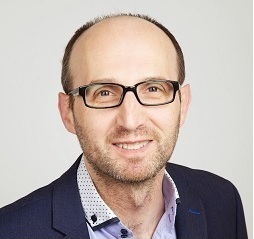 Range(“A1”).Value is a single value. But you cannot copy an array to a single value. You need to read through the array and compare each element. If cell.Value < 0 Then MsgBox ("Warning: Negative value!. "), , "Invalid Entry"
Can you email me the workbook paul@excelmacromastery.com? I have a large table that I’m creating a macro in excel to find and replace the in rest of my workbook. The error happens in the loop after the If statement (below is the highlighted portion when I debug). I believe the issue is the type of the x field, as when I debug it shows as Variant/Long but I’m not sure how to fix it. The values being updated are string fields a combo of alpha and numeric in each field. Lat, km_Lat is defined as a double and LongLat1,2() as strings. It seems the CDbl function is not returning a double as when I watch the right hand side of the equation, it returns a integer value. Could you possibly assist on this? When the error occurs, pause the code and place each part of the line in the Watch Window. This will help you isolate the error. Most likely is that something contains text characters. I have a Long variant that reads from InputBox function. When the user clicks “OK” without enter a number, I get a type missmatch error. How I can debug this bug? set the Type parameter to 1 to make them select a number. Otherwise, have the return variable as a variant and check the type when it is returned. I am getting a typemismatch error on the following line. I know its because the text box in my user form is blank but cant figure out how to code IF IS NULL value. You can use the IsDate function to check if the textbox has a valid date.